I like to think of myself as a foodie first and dietitian second. That means I never ever want to sacrifice flavor and enjoyment in the foods that I eat purely for the sake of health and nutrition. You should love what you eat, and that applies to vegetables too. 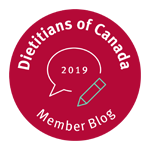 For many of the clients the team of dietitians in our nutrition counselling practice work with or in the group discussions of my online nutrition course, we often talk about how to make vegetables more flavorful. 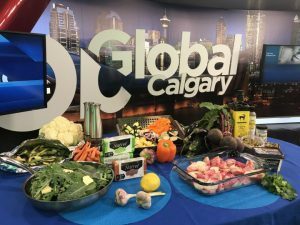 If you know you should eat more veggies but have are tired of the same old uninspired ideas – read on, as this is for you. What makes vegetables hard to love for so many people? 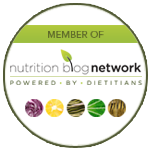 Have you experienced what I like to think of as PTVD (post traumatic vegetable disorder)? Many vegetables are not naturally sweet or savoury and some can even be bitter so you need to learn how to build flavor through the cooking method or what we add to them to synergistically create flavor. Healthy food tastes good, you just need some ideas on how to bring boring veggies such as plain asparagus or cauliflower alive. Many people overcook or boil the heck out of vegetables which makes them taste mushy and simply awful. I gag thinking about overcooked boiled broccoli falling apart on the plate served dry with nothing on top to flavor it. While some frozen and canned vegetables are tasty (such as frozen peas or canned stewed tomatoes or artichokes), many frozen or canned veggies lack taste and texture. If you have access and can afford fresh produce, always go for these. Frozen green beans or canned carrots will simply never taste as good as fresh. Always start with fresh, high-quality veggies and learn how to cook them to perfection. Any vegetable that has been kicking around in your fridge drawer for a long time naturally is less appealing. Buy seasonal items featured in your local grocery store and head to your local farmers market as in my opinion the vegetables there will be the best of the best. Blanch, lightly steam, pan-fry, stir-fry, roast or grill your veggies. 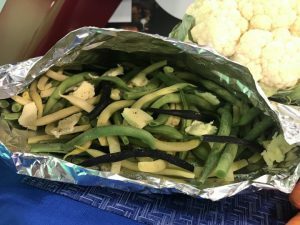 Roasting or grilling vegetables is my absolute favorite since these methods allow a beautiful caramelized flavor to develop adding more sweetness to your veggies. You can roast or grill just about any vegetable (more on that farther down). If you are unsure of the cooking times for a veggie, simply hop online to find out for sure. Set a timer as your beautiful veggies can go from awesome to mush in minutes. Keep in mind we are all subject to what researchers call sensory specific satiety, which means our senses (taste, smell and sight) get overwhelmed and numbed when we experience the same repetitive stimulus. Our eyes are much more in charge of what we eat than our stomach. The more variety, often the more we eat. One of the reasons people commonly overeat at a buffet, for example, is due to the fact we love to sample a variety of things. You can use this reverse psychology to trigger yourself to eat more veggies. This means that although it may be cheaper to buy a massive container of spinach this week, it may limit the amount of salad you want to eat this week. It may be more effective to spend a bit more on a smaller amount of spinach, bagged kale salad and head of cabbage for coleslaw (and keep in mind cabbage has a very long shelf life and will last you until next week or longer). Yup that is right – flavor with butter, oil and salt. I’ve never met a chef that wouldn’t tell you that fat and salt are the key to building flavor in meals. You don’t need to avoid the use of fat and salt in a healthy diet, you need to be mindful of where the best place to add these items will be. A note on butter: As a foodie first and dietitian second, I go for butter over margarine since a little goes a long way to bolster flavor and I like the fact the ingredients are simple. A teaspoon of butter only has about 35 calories and sure adds mega flavor. If you have a family member with a lactose intolerance you can try Natrel lactose free butter made from 2 ingredients – lactose free cream and sea salt. 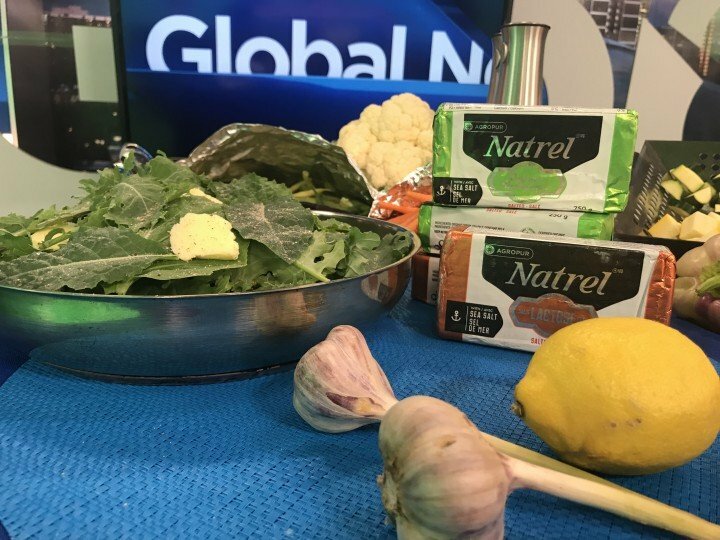 My client Agropur Natrel recently added this to their high-quality lineup from a dairy cooperative in Canada along with an organic sea salt butter made also from only 2 ingredients (organic cream and sea salt). A note on salt: Most of the salt people take into their diet comes from packed and processed foods rather than what is added to freshly prepared vegetables. 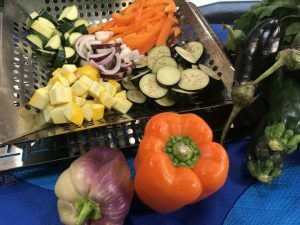 A small pinch of salt on your veggies can sure round out the bitterness to help you enjoy your vegetables astronomically. A note on toppings: While topping your veggies with a spoon of nuts/seeds or diced bacon/pancetta can add some extra calories – often these add so much enjoyment that you will want to eat MORE veggies than other items on your plate. You can also flavor with very low-calorie ingredients such as fresh chopped herbs (such as parsley or dill), seasonings (such as Italian/Greek seasoning or smoked paprika), balsamic crema, fresh squeezed lemon/orange and more! 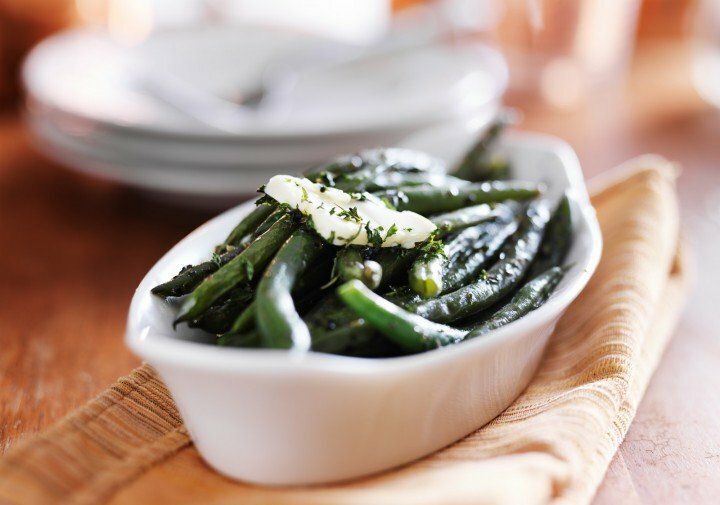 Green/yellow beans – toss steamed beans with butter. Optional: top with chopped toasted almonds or chopped sundried tomatoes packed in oil. Parsnips and carrots – chop parsnips and carrots into matchsticks and pan-fry until tender in melted butter with fresh squeezed lemon juice. Top with fresh chopped parsley or dill. Kale/swiss chard – wash kale or chard (don’t dry the leaves as it helps to steam). Cut into ribbons that are ½ -1 inch across the stem. Melt a pat of butter in a saucepan and sauté minced garlic and kale for about 5 minutes until wilted. Remove from heat and stir in a splash of fresh squeezed lemon juice and season with salt and pepper. Top with freshly grated parmesan cheese. 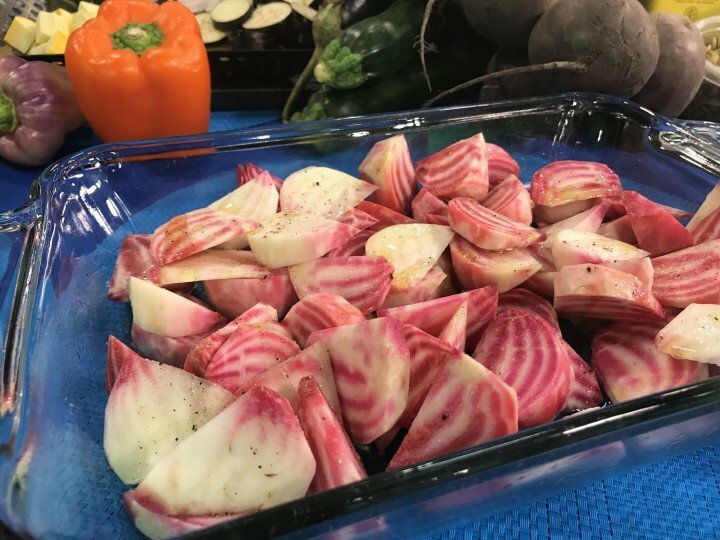 Beets – tossed with olive oil, salt and pepper and roasted in the oven or in tinfoil for the BBQ. Optional: Top with goat cheese or feta cheese. Brussels sprouts – tossed with avocado oil, salt and pepper and roasted in the oven or in tinfoil for the BBQ. Optional: Top with dried cranberries and a drizzle of balsamic crema. Cauliflower – tossed with vegetable oil, salt and pepper. Optional: Top with a drizzle of tahini (sesame seed paste). 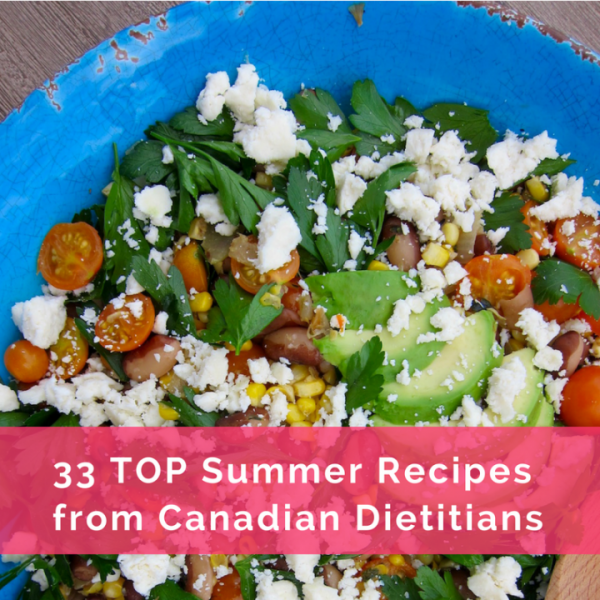 Looking for some summer recipe inspiration? 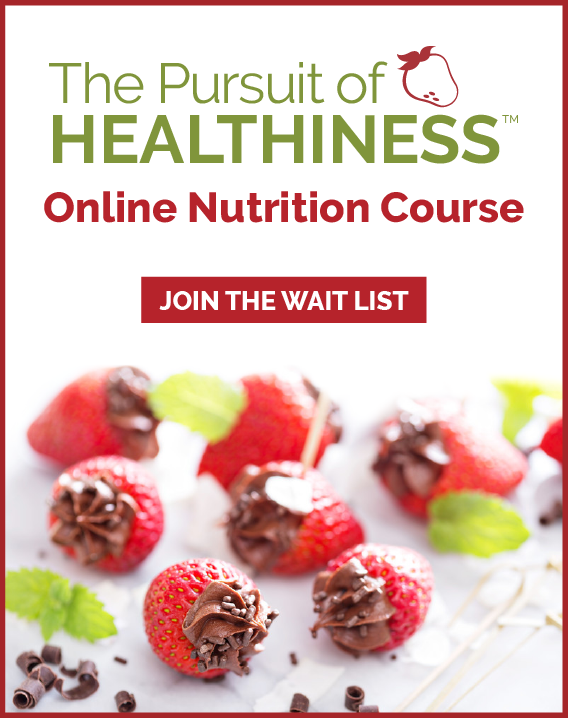 Download our recipe list. These tasty options include pot-luck/bbq friendly salads, fruit focused desserts, and some tasty main courses. Hope you enjoy!